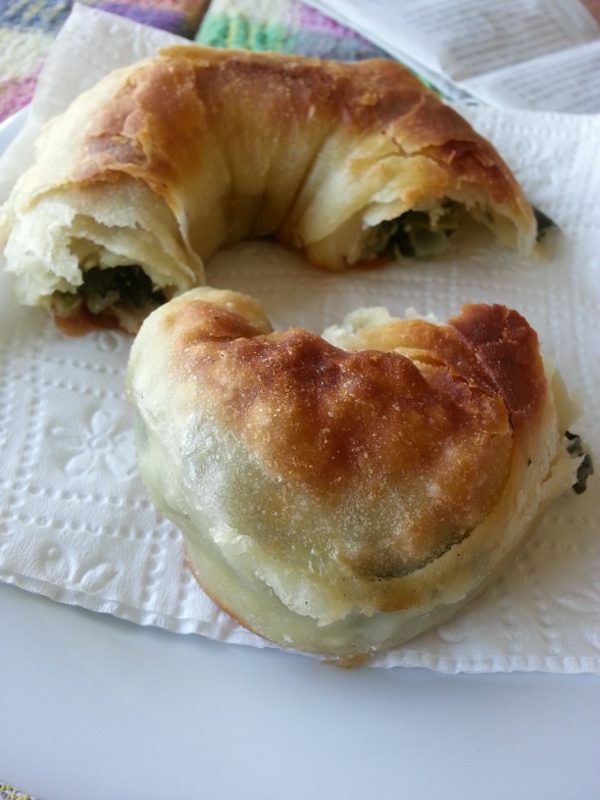 A Turkish pastry made of hand-rolled dough, lightly brushed with butter and eggs, filled with spinach, cheese, eggplant or potatoes and sealed and cooked over griddle. We came across these when we were in Cappadocia (central Turkey). 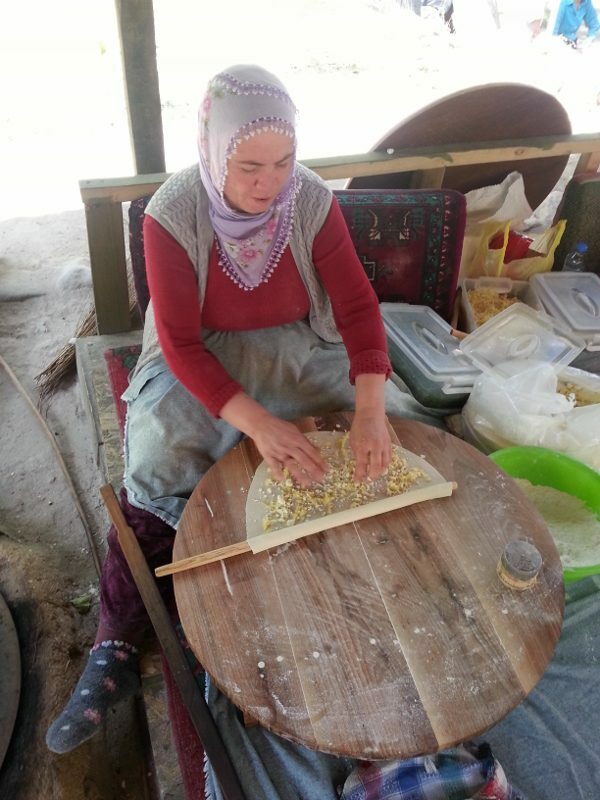 Local women were sitting on the ground, rolling out the dough and placing it on an open griddle. 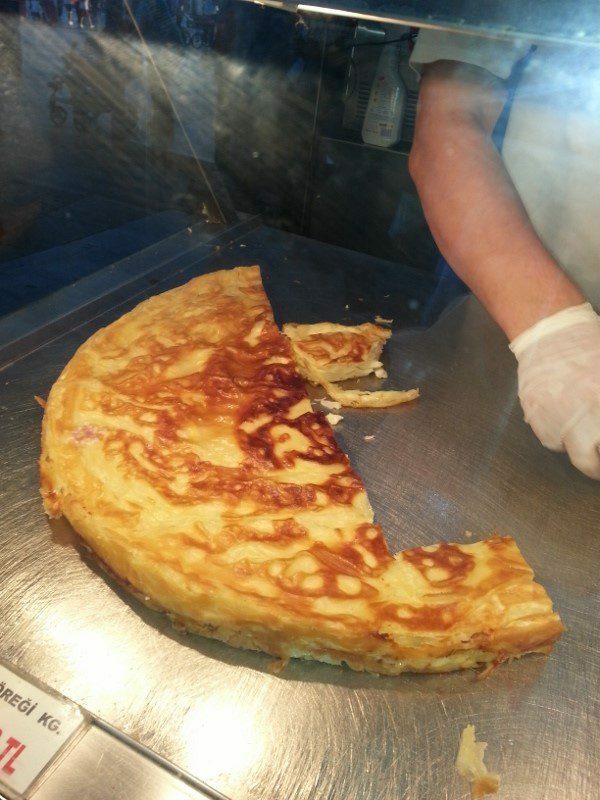 Gozleme looks like a quesadilla but it’s light, buttery and delicious. 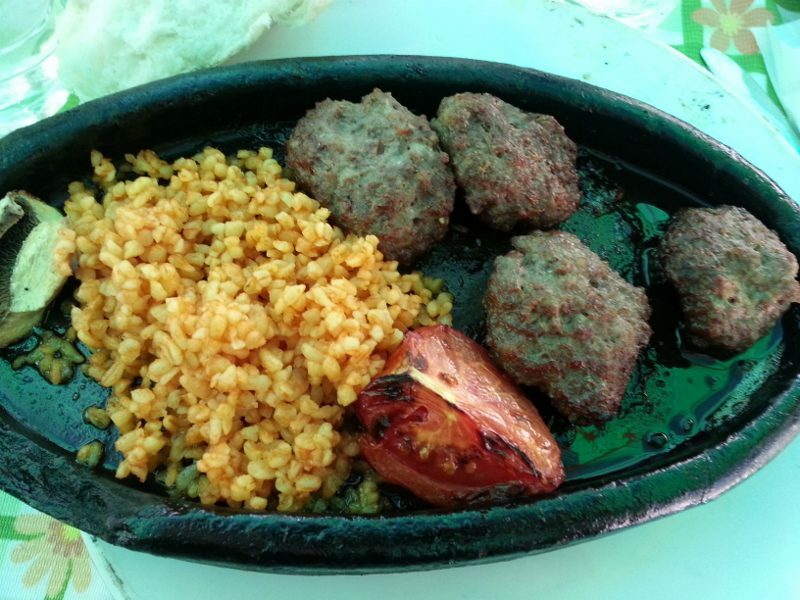 Also known as Turkish meatballs, they are a blend of beef and lamb and are juicy, light, and flavorful. This Turkish sandwich filled with salami, pepperoni, kasar cheese and tomato, is a local Çesme specialty so we had one when we were in Alaçati. What makes this sandwich so delicious is the soft bread (which looks like a baguette), made with chick pea flour and grape molasses with sesame seeds sprinkled on top. 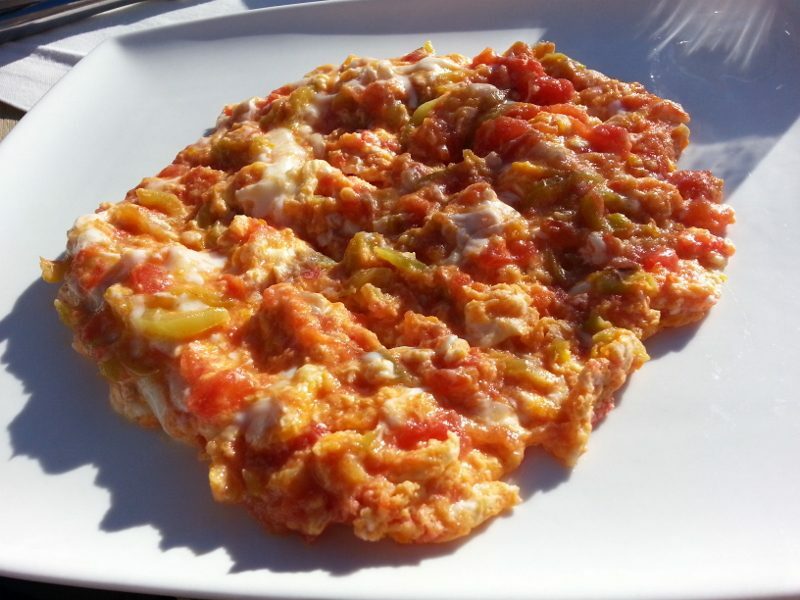 A Turkish style omelet with tomatoes, green peppers, it looks more like scrambled eggs. Cooked in copper skillets, this dish is light and juicy. And, it’s fun to say. Say it out loud and you might start singing the Muppet’s song…..”ma nah nah nah”. 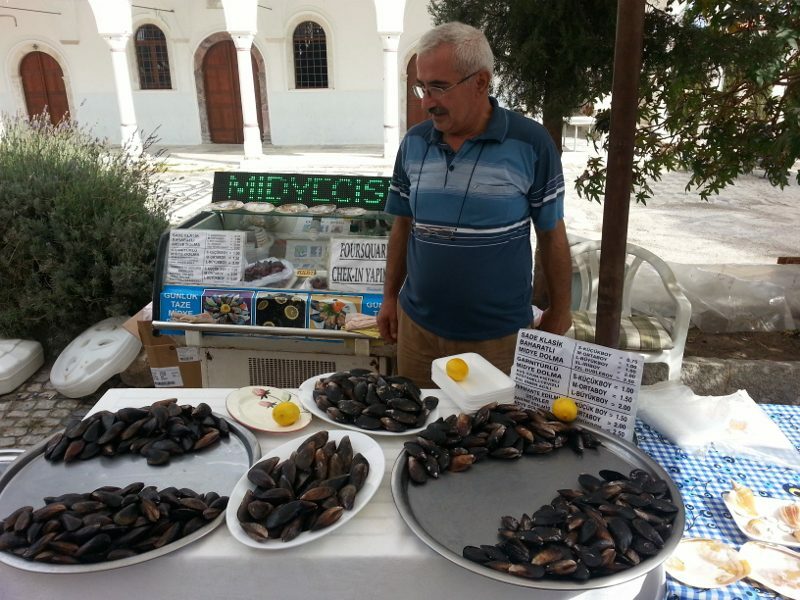 When you think street food, mussels are probably not what come first to mind. But, there are vendors all over Istanbul selling them. 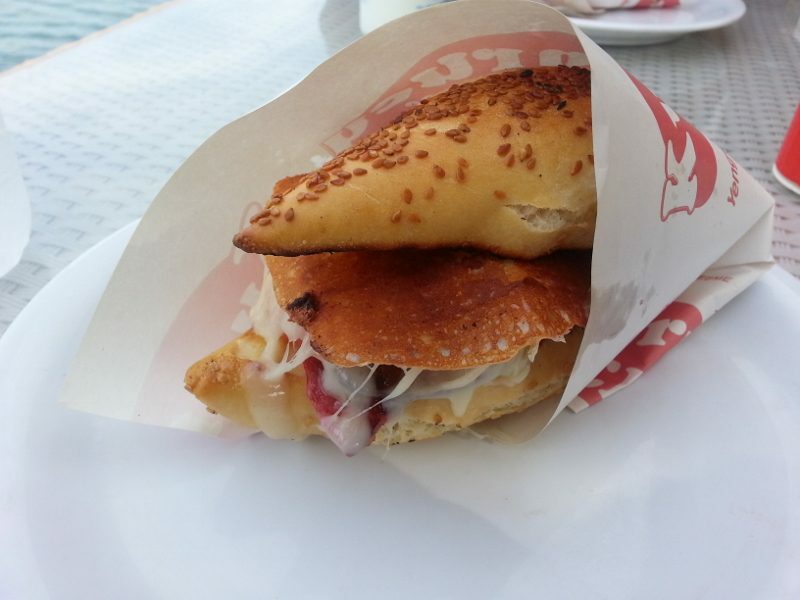 We were hesitant to try them while in Istanbul but luckily got another chance when we were in Alaçati. 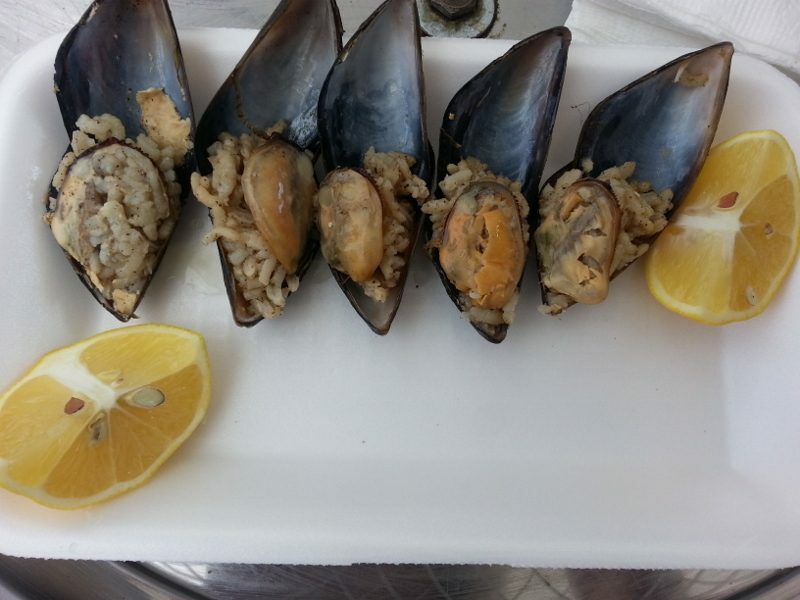 These mussels are served with boiled rice, black pepper, oil and a hint of cinnamon. Lemon juice is added right before eating them. A highly seasoned, air-dried cured beef, it is made by salting the meat, then washing it with water and then letting it dry for 10-15 days. The blood and salt is then squeezed out of the meat which is then covered with a cumin paste made with crushed cumin, fenugreek and hot paprika. It is then air-dried. 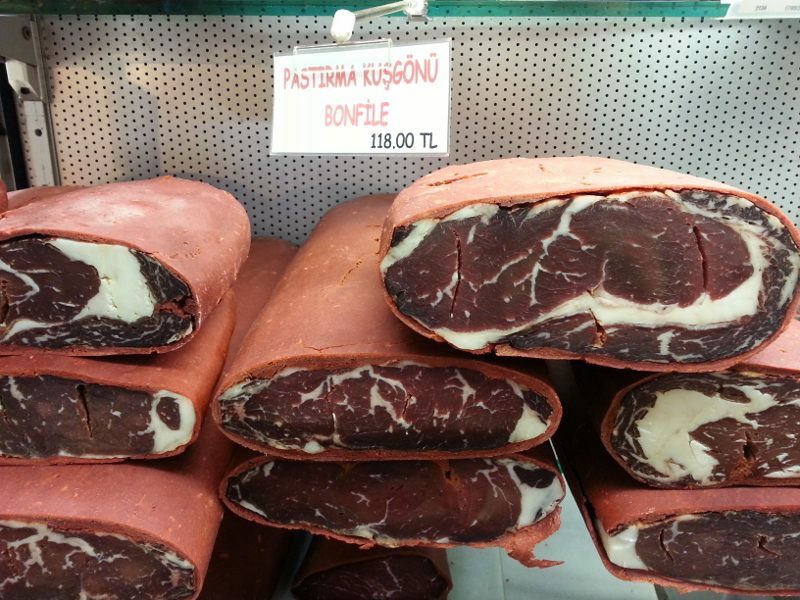 If you like Italian bresaola, you will like pastrima. 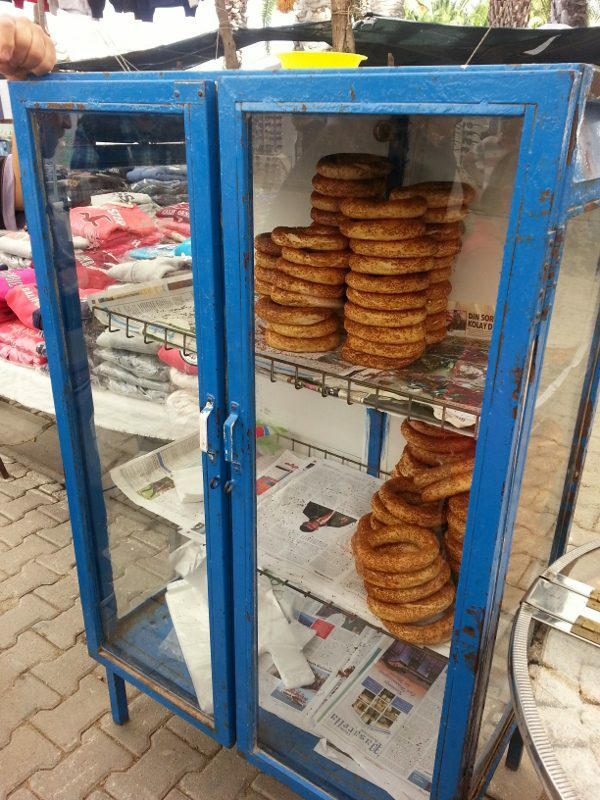 A circular bread encrusted with sesame seeds, simit is similar to a bagel but not as doughy inside. 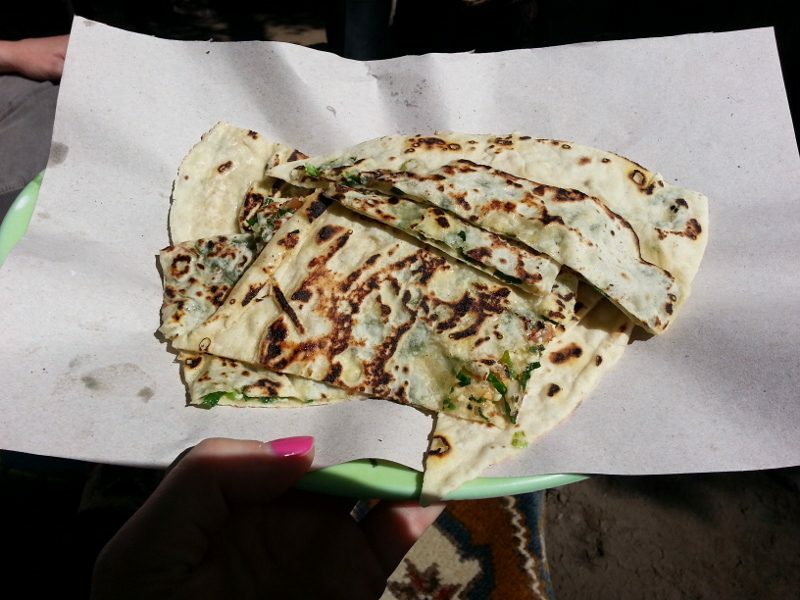 Simits are sold by street vendors throughout Turkey and vary in size. 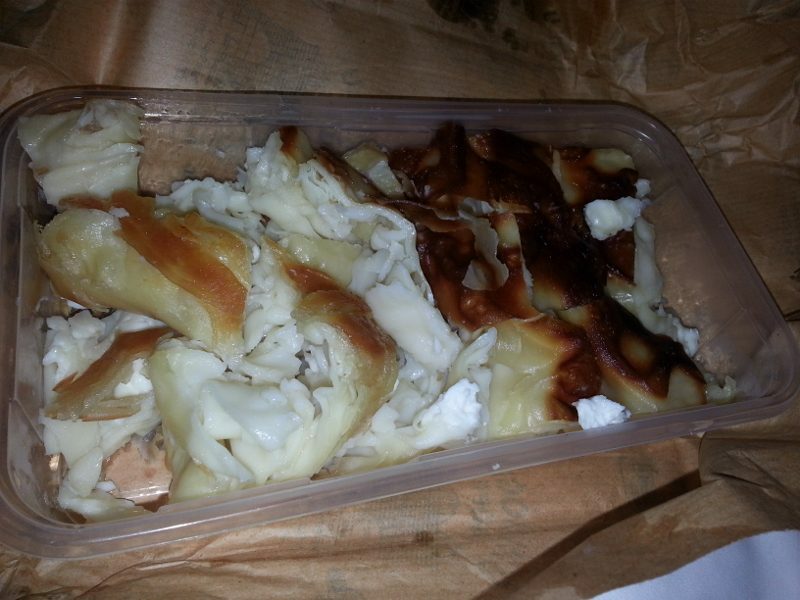 Within the Borek family, Su böreği (‘water börek’) is one of the most common types. Layers of dough are boiled in large pans. A mixture of feta cheese, parsley and oil is scattered between the layers. The whole thing is brushed with butter and placed in a masonry oven to cook. This dish reminded me of my mom’s noodle kugel, or even a form of mac-n-cheese. But, this handmade flaky pastry melts in your mouth. 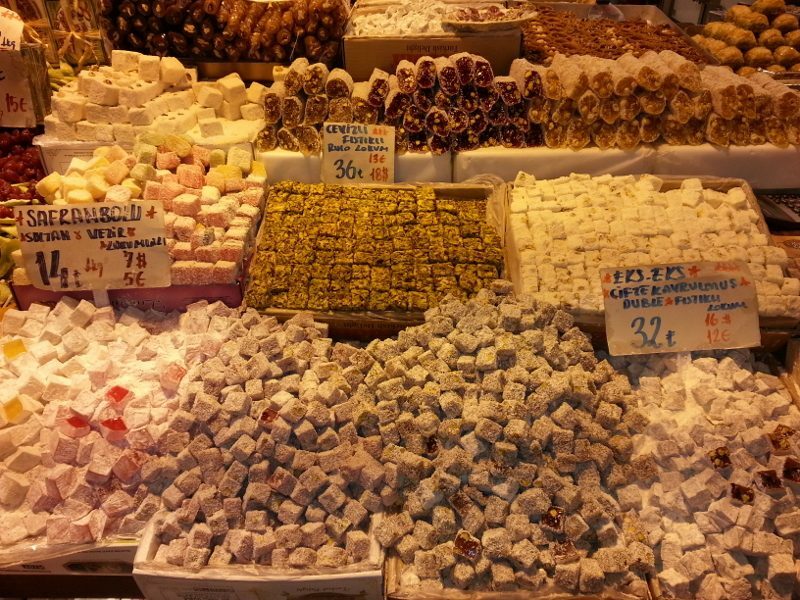 A list of Turkish “delights” can’t leave off “Turkish Delight”, a family of confections made with dates, pistachios, hazelnuts or walnuts bound by a gel of starch and sugar and flavored with rosewater, mastic, cinnamon, Bergamot orange, pomegranate, coffee or lemon. Eaten in small cubes dusted with sugar or powdered cream of tartar, there isn’t an airplane flight in Turkey that doesn’t welcome you with a small cube of traditional pistachio Turkish Delight. But, if you head to the Spice Market in Istanbul, you will find more choices and flavors. Whether you are in Turkey or at home, we know you will enjoy experiencing these dishes. 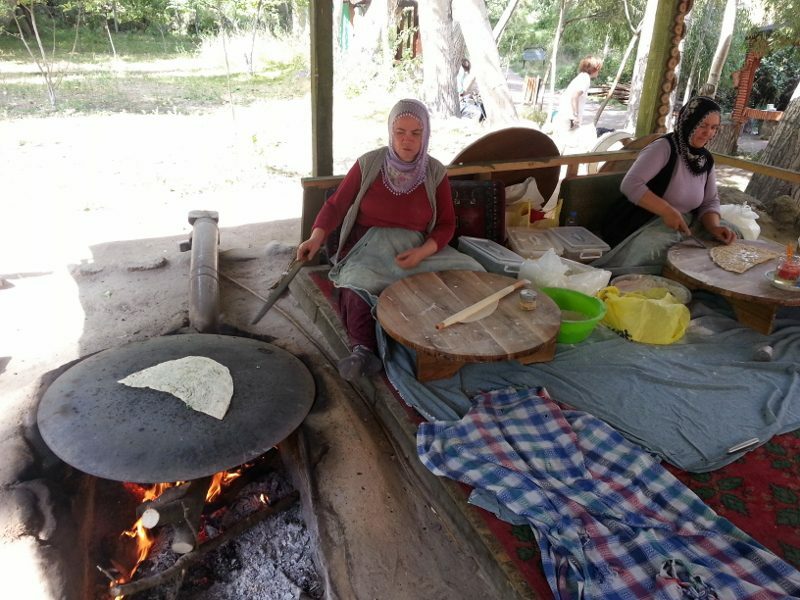 This entry was posted in Food, Travel and tagged Borek, food, Gözleme, Koftes, Kumru, Menemen, Mussels, Pastirma, Simit, Su böreği, Turkey, Turkish Delight, turkish food by Allison Levine.